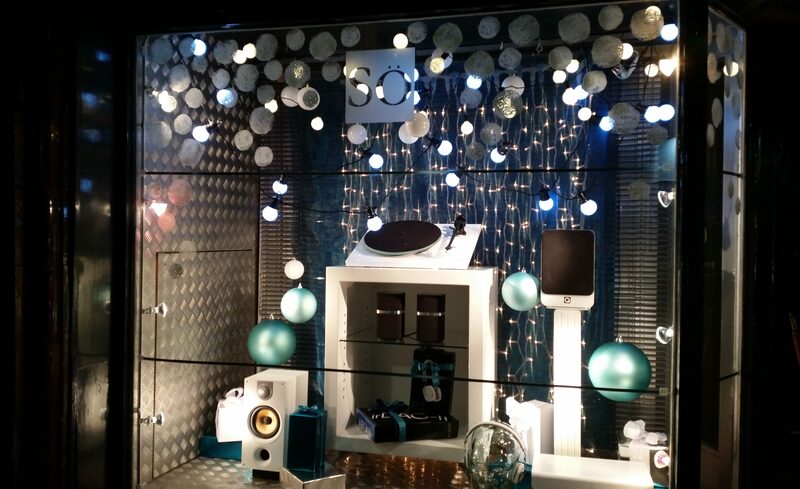 Have you planned your window displays for the coming year yet? 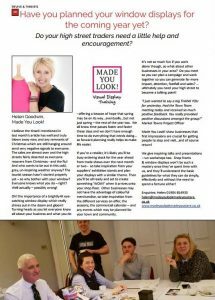 Do your high street traders need a little help and encouragement? I believe the tinsel I mentioned in last month’s article has well and truly blown away now, and any remnants of Christmas which are still hanging around send very negative signals to everyone. The sales are almost over and the high streets fairly deserted as everyone recovers from Christmas – and the flu! And who wants to be out in this cold, grey, uninspiring weather anyway? The tourist season hasn’t started properly yet – so why bother with your window? Everyone knows what you do – right? Well actually – possibly wrong! This was our stand at the VM & Display Show at the Business Design Centre recently. A great place to meet like-minded industry experts! Utilising our branding colours we wanted to illustrate a few points used frequently in display: colour of course; props;; fabric handling; pyramids; space; lighting; the difference different colour backgrounds can make and of course movement . British Flower week was approaching and I was invited to create two displays in York to celebrate it. 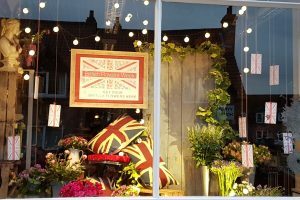 The Paper Studio wanted to create a video inspiring florists as to what they could achieve with their window space, so Grant asked Floral Elegance in Acomb and David from Wards if they’d kindly lend us their windows. The Paper Studio provided the posters and tags, Flowers by Clowance provided some beautiful British grown flowers – and I did the rest …and Grant got his camera out! Made You Look! go International! We were recently invited to Global Travel Group’s annual Conference at La Manga in Spain. Well – we couldn’t say ‘no’ now, could we?! 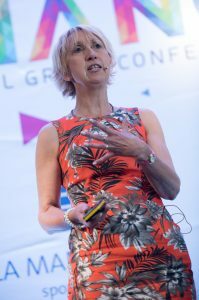 We were invited to speak to tour Operators and Travel Agents to inspire them as to what is possible and how they can create eye-catching displays to promote their amazing holidays. Many are home-workers, but for those who do have a high street presence quite often their windows are full of posters and hand-written signs…not really selling that holiday dream! Is your high street full of colour and excitement with vibrant shop window displays to lure visitors to stop, explore and spend – or is it rather dull and un-inviting so visitors drive straight through looking for somewhere more inviting to stop and stay…? When was the last time you walked down the High Street and stopped to admire a fabulous window display? I’m sure you remember the shop and what they sold. Or maybe you noticed a shop that was so scruffy your general assumption would be (quite possibly incorrectly) that it was yet another statistic in the demise of the High Street. Christmas is nearly here! Have you noticed? The Northwich Business Improvement District is always looking at ways in which it can help the town’s companies, traders and organisations grow and succeed. 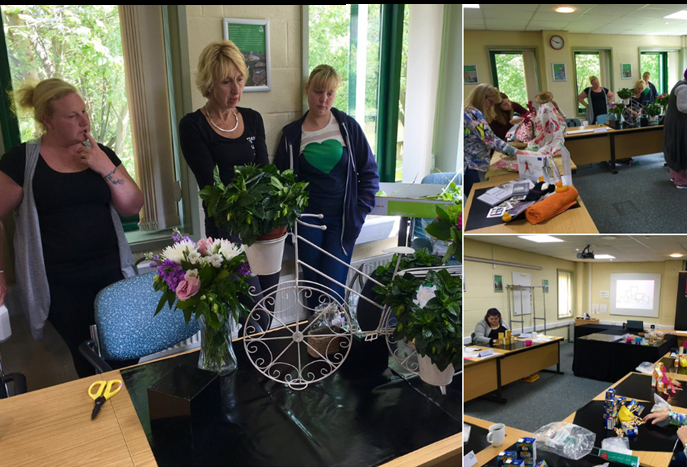 As part of this commitment, the BID held a Window Display Masterclass Training Course at its offices in Northwich on Tuesday 5th July. Funded and organised by the BID, the course, run by Made You Look!, taught attendees how to make stunning visual window displays to help them market their offerings in the best way possible and increase interest and footfall in their store. A1 Retail magazine very kindly invited us to feature in their Question and Answer section this month on Visual Merchandising. There are many skills and specialisms involved in successful ‘Visual Merchandising’ and we explain how our training for window and interior visual displays and styling fits in. ‘Window Dressing’ isn’t just ‘fluff’ – it is a crucial, silent selling technique which generates sales . Made You Look! at The Treasury! 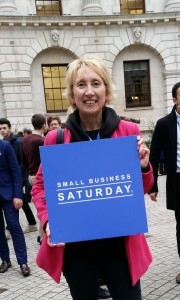 Many of you will know about Small Business Saturday which took place on December 5th this year. Small Business Saturday originated in the States where it was launched by American Express in order to raise the profile of small retailers. Now running in this country too, any small firm looking to take part can join in. 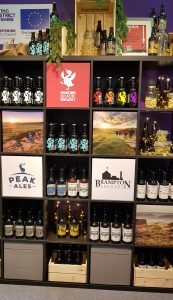 Attention is focused on the small independent business, especially encouraging people to ‘shop local’ in the run-up to Christmas. 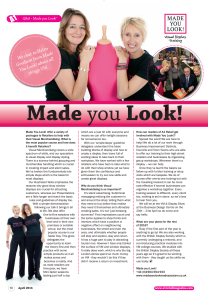 We were delighted when Small Business Saturday chose Made You Look! from many businesses around the country to highlight as one of their ‘Smallbiz100’ in the days leading up to the big event itself. We received a whole day of exposure on social media as well as press coverage, and attended the Bus Tour where we ran a Visual Display Presentation along with free consultations.